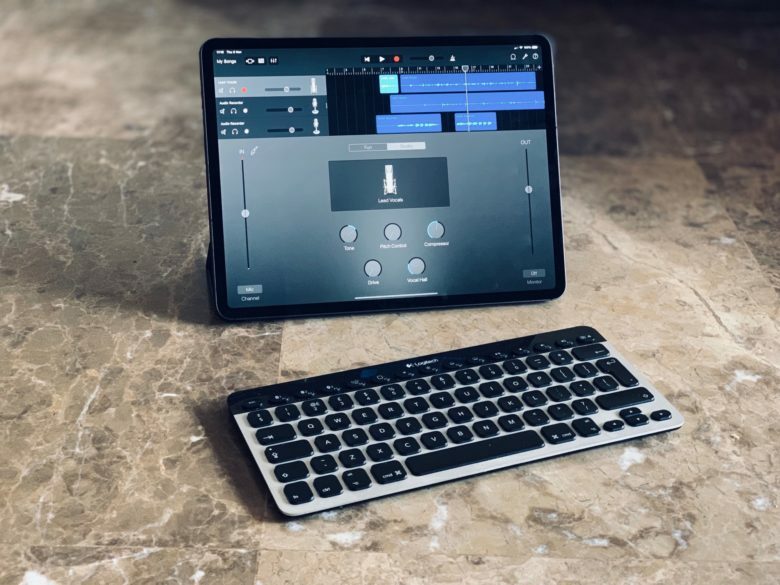 Finally, GarageBand can be controlled from a keyboard. 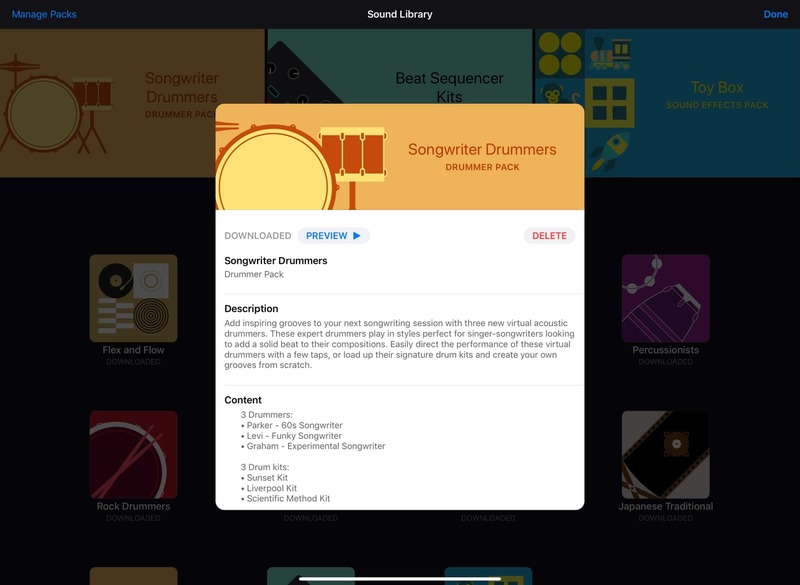 GarageBand for iPad just got a great new update, adding three new drummers, gimmicky face-controlled audio effects, and one huge game changer: Keyboard shortcuts. Drummers are one of GarageBand’s great features. They’re virtual drummers who just come up with a groove for you. They’re great for playing along to, and you can tweak them to fit your track, and even have them follow the tempo of live instruments. Drummers have names, and play in certain styles. The three new Songwriter drummers are named Levi, Parker, and Graham. GarageBand’s keyboard shortcuts, part one. As you can see, pretty much everything is covered. You can navigate the entire main screen, switching between tracks, skipping to sections of tracks, and selecting any number of them. You can play, record, undo and redo, toggle the metronome and the count-in, mute of solo a track, split and join sections, and a whole lot more. 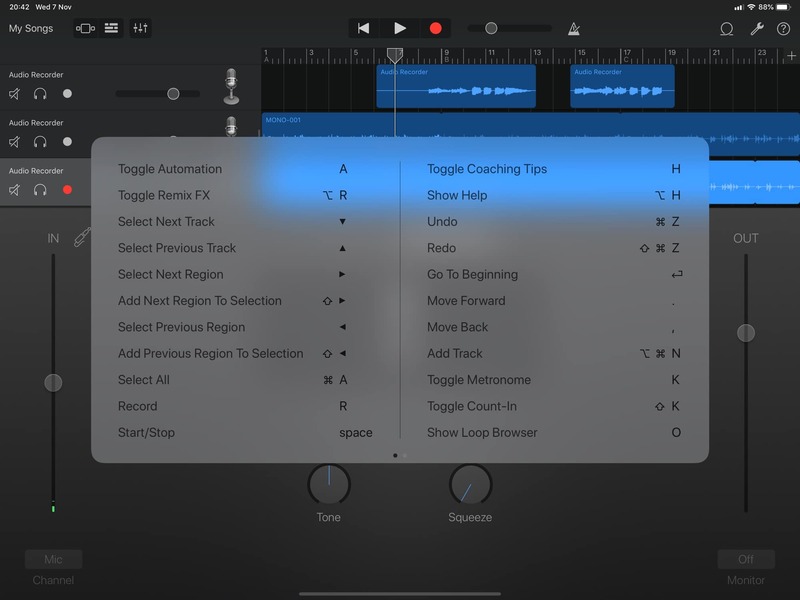 I use GarageBand a ton, and I’m having trouble coming up with a shortcut I’d want that isn’t listed here. That’s not to say that I can’t think of more connectivity options that I do want. Support for MIDI controllers would be great, so you could control the volume slider for each channel with real physical fader controls. But to be honest, I’m pretty pleased with these keyboard shortcuts. They’re going to make a huge difference to how I work.